Colonel Dan Goldfus, commander of the 769th Hiram Infantry Brigade, said in September 2014 that Hizballah had an estimated 100,000 rockets — 10 times as many as were in the Hamas arsenal — and that its 5,000 long-range missiles, located in Beirut and other areas deep inside Lebanon, were capable of carrying large warheads (of up to 1 ton and more), with precision guidance systems, covering all of Israel. According to the IDF "July 12, 2006: Hezbollah terrorists attack an IDF patrol, kill three IDF soldiers and kidnap two. Israel goes to war. In the next 33 days, Hezbollah fires approximately 4,000 rockets into Israel. Hezbollah killed a total of 119 IDF soldiers and 44 Israeli civilians during the war. In 2006, Hezbollah's arsenal consisted of 20,000 rockets and missiles. In 2013, Hezbollah's arsenal consists of 100,000 rockets and missiles." Hizballah's militia is a light force, equipped with small arms, such as automatic rifles, mortars, rocket-propelled grenades, and Katyusha rockets, which it occasionally has fired on towns in northern Israel. US officials say it did not have truck-mounted multiple launch systems for the Katyushas as of 1995. Instead, the rockets are normally fired from improvised static launchers, sometimes consisting of little more than a few boards. In this way, the launching crew can leave the area and fire the rocket remotely, safe from Israeli counter-battery fire. In mid-1993 Hizbollah launched Katyusha rockets on towns in northern Israel, such as Qiryat Shemona. Israel subsequently began striking Hizbollah positions in civilian areas in southern Lebanon in an effort to pressure Syria and Lebanon to curb Hizbollah. On 11 April 1996 Hizballah fired missiles into Israeli villages and towns, driving a quarter of a million Israelis into bomb shelters or flight. This prompted Israel to launch a massive bombardment of Hizballah bases in southern Lebanon. When Prime Minister Shimon Peres launched Operation Grapes of Wrath, the plan was to whip Hizballah into submission by bludgeoning the landscape until Lebanon and Syria cried uncle. Israel's response against Hizballah was a high-tech blitz, targeting specific buildings and vehicles hiding the enemy, while avoiding civilian casualties. In fact, two ambulances were hit, and three power plants were damaged. On 19 April 1996 Israeli artillery hit a United Nations compound near the village of Kana, where civilians had sought shelter from the attacks. More than 100 are killed. The artillery was directed by modern US-made counterbattery radar, which had tracked the trajectory of Hizballah's Katyusha rockets and spotted the location from which they had been fired. But by the time the Israelis fired, the Shi'ite guerrillas and the Katyusha launcher were gone. The 1996 Grapes of Wrath ceasefire accord stated that Hizballah and Israeli troops must not attack civilian targets or use civilians as cover, even while assaulting each other's forces inside Lebanon. In 1995 and 1996, during a period of time when Israel was enduring Katyusha rocket attacks from the Hezbollah across its northern borders, the US offered to Israel -- and they accepted -- the Tactical High-Energy Laser system, which they have been working on. It is a system that's designed specifically to deal with Katyusha rocket attacks from across the border. It is a system that Israel and the United States have worked on, and that is one system that they should be able to use if they experience Katyusha rocket attacks. On 24 May 2000 Israeli Prime Minister Ehud Barak fulfilled a campaign promise and ended Israel's 22-year occupation ofsouthern Lebanon. Hezbollah saw this as a massive victory. In Israel, Barak was under fire for his withdrawal from Lebanon and for being ineffectual with the Palestinians. In early 2001 it was reported that Hizballah had set up a belt of mobile multi-barreled rocket launchers and truck-mounted missiles along Israel's northern flank ready to go off the moment Israel launched a large-scale military offensive against Lebanon. The Japanese-made Isuzo truck launchers carry Fajr-3 (Arabic for dawn-3) projectiles, a third generation of Katyusha rockets manufactured by Iran's air force industry. In October 2002 it was reported that Iranian Zelzal-2 short-range ballistic missiles had been delivered to Iranian Revolutionary Guard units in the Beka'a Valley in Lebanon. Israelis sources frequently claim that long-range rockets have been transferred to Lebanon, including 240mm versions of the standard 122mm 'Katyusha' rocket, and Iranian Fajr-3 and Fajr-5 rockets. The unguided Zelzal-2 ballistic missiles, intended to strike area targets such as communities and cities, are equipped with explosive warheads weighing up to 600 kilograms. The longer range rockets require some expertise to aim and use effectively, which may be beyond the capability of the Hizballah to operate without direct Pasdaran support in the field. The head of Israeli Military Intelligence reported in 2004 that Hezbollah had 13,000 rockets, most with a 25-kilometer range, about 500 with a range of 45 kilometers [Fajr-3] to 75 kilometers [Fajr-5], and a few dozen with a 115-kilometer range [Zelzal-2]. A senior Military Intelligence officer told the Knesset's Defense and Foreign Affairs Committee in 2006 that Hizbullah possessed thousands of rockets with a 20-kilometer firing range as well as some 100 rockets capable of reaching targets of 40-70 kilometers. 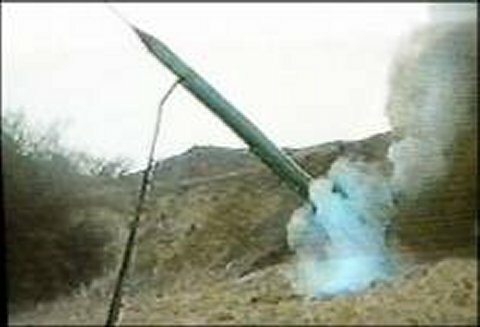 Hezbollah had not used the Fajr rockets until the July 2006 conflict. Iran appears to have furnished Hizballah with their unarmed Mohajer-4 UAV, which was flown over northern Israel on 07 November 2004 and 11 April 2005, both times surprising Israeli air defenses. In November 2004, Hizballah launched an unmanned aerial vehicle (UAV) that left Lebanese airspace and flew over the Israeli town of Nahariya before crashing into Lebanese territorial waters. Ten days prior to the event, the Hizballah Secretary General said Hizballah would come up with new measures to counter Israeli Air Force violations of Lebanese airspace. Hizballah fighters raided north Israel in a botched attempt to capture Israeli troops November 21, 2005, triggering the worst round of fighting since Israel pulled out from south Lebanon five years ago. Hizbollah also fired salvoes of Katyusha rockets into Israeli posts in the Shebaa Farms. On 28 May 2006 Hezbollah launched a Katyusha barrage at an IDF base on Mt. Meron. Israel responded immediately by hitting a number of Hezbollah positions along the border. On 13 July 2006 Hizbullah launched a rocket at Haifa. 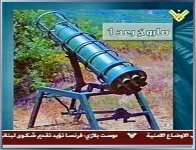 Minutes before the firing, Hizbullah's al-Manar showed a new rocket which they said will hit "the strongholds of the Zionist enemy." The Hizbullah said they fired a Ra'ad 1 missile at Israel. "That's the missile used by Hizbullah to respond to Israeli attack and to hit military strongholds of the Zionist enemy. The rocket is of 333 mm in diameter and has a warhead of 100 kilograms. Our fighters used it today when they attacked the military base in Har Meron which was severely damaged and set on fire." However, an examination of the rocket depicted in the television newscast makes clear that it is not the 45-km range Fadjr-3, but rather the Shahin-1, which has a range of only 13 km. Al-Quran Sura 13, ar-Ra'ad, takes its name from the word (ar-Ra'ad) (thunder) that occurs in verse 13: "The thunder praises His glory, and so do the angels, out of reverence for Him. He sends the lightning bolts, which strike in accordance with His will. Yet, they argue about GOD, though His power is awesome." Allah impressed on the Believers that they should not lose heart, if He is giving the enemies of the Truth a rope long enough to hang themselves. As of 15 July 2006 it was reported that about 350 rockets had been fired into Israel in the current round of fighting, representing a massive escalation above the previous harassing fire of random rounds against border settlements and Israeli military targets. As of 18 July 2006 it was reported that Hizballah had fired more than 700 rockets into Israel, representing a sustained rate of fire of about 100 rockets per day since fighting errupted on 12 July 2006. On 28 July 2006 Hizballah fired what it called Khaibar-1 rockets at the northern Israeli town of Afula. Seven of the rockets hit outside Afula without causing injuries. The attack came two days after Sheik Hassan Nasrallah had stated that Hizballah would fire rockets at targets beyond Haifa. 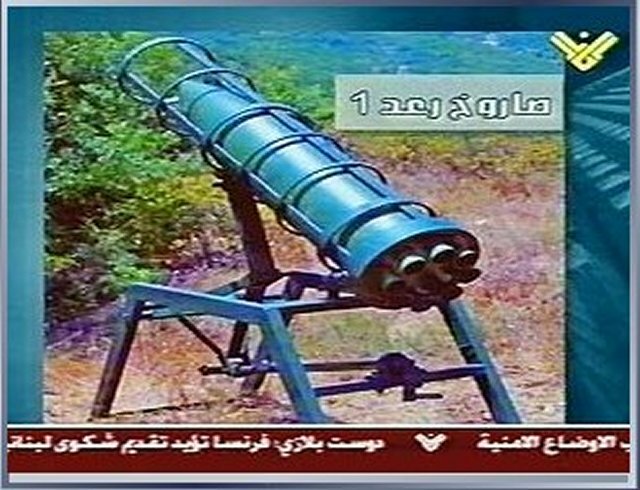 In a message, aired by Lebanon's al-Manar and Iran's al-Alam networks on Wednesday 26 July 2006, Nasrollah made it clear that in response to Zionist atrocities Hezbollah combatants will launch missile attacks against cities in Occupied Palestine well beyond the port city of Haifa and will fight the Zionist invasion of south Lebanon. The rocket was probably a renamed Fadjr-5, marking the first time Hizballah had launched the Iranian-made weapon with a 75-km range. If fired from the Lebanese border, it could hit the northern outskirts of Tel Aviv. By naming their rocket Khaibar, Hizballah reminds Muslims that they can fight outnumbered against the Jews and win. "Khaibar" means: "fortified place". Modern Khaibar is one of seven Counties in Saudi Arabia, located to the Northeast of Medina. The rocket was named after the famed battle between Islam's prophet Muhammad and Jewish tribes in the Arabian peninsula. When Amrozi bin Nurhasin, the Bali bomber, entered the courtroom on the day of his sentencing, he shouted "Jews, remember Khaibar. The army of Muhammad is coming back to defeat you." The valley surrounding Khaibar was considered one of the most fertile of the desert oases and its gardens of date palms were jealously guarded by the Jewish tribes whose territory it was. The Jews of Khaibar were considered the bravest warriors, and they posed a most powerful challenge to the supremacy of Islam. In 628 Khaibar was subdued by the Prophet Mohammed - 1,400 Muslims overcame some 10,000 Jews. By naming their rocket Khaibar, Hizballah reminds Muslims that the victory at Khaibar established the institutions of the Islamic State for the Muslim conquest of non-Muslim peoples. After the victory of Muslims at Khaibar, the Jews were allowed to survive on the payment of special taxes. Under Islamic law, Kharaj [land tax] must be imposed of all lands conquered by force and not to be divided among the army but left to the original owners or allocated to non-Muslim settlers. Kharaj was first introduced after the battle of Khaibar, when the Holy Prophet (peace be upon him) allowed Jews of Khaiber to return to their lands on condition that they paid half of the produce as Kharaj. Jizyah [compensation] was a poll-tax levied on those who did not accept Islam, but lived under the protection of Islam, and were thus tacitly willing to submit to the ideals being enforced in the Muslim State. Since Christian and Jews were exempted from military service under the Islamic state, the Islamic state guaranteed their security in exchange of payment of Jizyah. Thus the dhimmi [the protected ones] evolved. By naming their rocket Khaibar, Hizballah reminds Shia of the origins of their schism with the Sunni. The Shia are the Shiat Ali -- the party of Ali. The Shia Imamate began with Ali, who is also accepted by Sunni Muslims as the fourth of the "rightly guided caliphs" to succeed the Prophet. Shias revere Ali as the First Imam, and his descendants, beginning with his sons Hasan and Husayn, continue the line of the Imams until the twelfth. At Khaibar the Messenger of Allah handed over his banner to Imam Ali, and thus designated him as the man whom Allah and His Prophet loved. He directed him to lead the assault and to fight until the Jews submitted. Abul Fida says the following in his book of history: (Tarikhu 'l-mukhtasar fi Akhbari 'l-basha): " ... the Prophet said, "By Allah, tomorrow I will give the standard to a man who loves Allah and His Messenger and whom Allah and His Messenger love, one who is constant in onslaught and does not flee, one who will stand firm and will not return till victory is achieved."" Ali fought till Allah granted him a clear victory. Various Hadith [Ansab al-Ashraf, vol. 2, pp. 93-94, on the authority of Abu Hurairah and Ibn Abbas, in similar wordings; al-Nisa'i, Khasa'is Ali bin Abi Talib. 1st ed., (Beirut: 1975), p. 9ff; al-Isabah, al-Isti'ab, HiIyat al-Awlya', and in Muslim's Sahih, in similar wordings] attest the following: "Ali, had I not been afraid that the Muslims would start regarding you as the Christians regard Jesus, I would have said things about you which would have made the Muslims venerate you and to consider the dust of your feet as something worth venerating; but it will suffice to say that you are from me and I am from you; you will inherit me and I will inherit you; you are to me what Aaron was to Moses; you will fight for my causes, you will be nearest to me on the Day of Judgement; you will be next to me at the Fountain of Kawthar; enmity against you is enmity against me; a war against you is a war against me; your friendship is my friendship; to be at peace with you is to be at peace with me; your flesh is my flesh; your blood is my blood; who obeys you obeys me; truth is on your tongue, in your heart and in your mind. You have as much faith in Allah as I have. You are a door to me. As per the order of Allah, I give you these tidings that your friends will be rewarded in Heaven and your enemies are doomed for Hell."